Have you ever had someone tell you, "You MUST read this book!" Yes, well, so have I, and some of the books recommended to me have blown me away and others have left me wanting, especially in the category of parenting books. So if you're anything like me, you've had a lot of good books, and a lot of not-so-good books, recommended to you. During a talk I recently gave to a group of young moms, one of the women said, "I won't have anything to do with parenting books. All of the books I read only made me feel bad about myself as a mom and made me crazy trying to do all the things I was supposed to do to make my child successful." I understood her angst, as most of the parenting books I'd read did the same thing to me. There are exceptions, no doubt, like the amazing book "Give Them Grace" by Elyse Fitzpatrick and her daughter Jessica Thompson. But because the vast majority of parenting books did me in, I fully understood why this particular mom had written them off. My point is, I take "book recommending" seriously because as a mom of littles, I realize time is precious, and not all books do a soul good. And it is, therefore, with full confidence and a thankful heart that I introduce you to my friend, Kimm Crandall, and encourage you to give yourself the gift of reading her book that was just released entitled, "Christ in the Chaos: How the Gospel Changes Motherhood." Kimm knows GRACE and she writes gospel truth. Freeing, saving, life-giving gospel truth. "If we give our children grace today with the intent of changing their behavior, are we really giving them grace? No, we are merely making grace into a new parenting rule. Another law that tells us, "do this and you will get this." Grace has no expectations. Grace gives without getting. May we see our children as fellow souls in need of the mercy that God has poured out on us through his Son. And may our constant prayer be, "Lord, help me to love them as you have loved me." I asked Kimm if she'd answer a few questions and share an exceprt from her book, and she graciously agreed. Enjoy and be blessed! Christ in the Chaos was born out of my search for rest. I was tired of being beaten down by the “try harder” “do better” mom laws. I broke under the pressure to perform to a standard that had been set before me, not realizing that it was anti-gospel. We were never meant to work our way to God; that is why he calls us to rest. If there is one thing that mothers (and everyone else) do not need to hear is that they must work hard to earn their right standing with God. This is the message that is being preached in many pulpits, books and blogs, especially when it comes to parenting. This is not good news! I wanted to write something that would shout the gospel over all of the law that is being fed to mothers who are struggling to stay afloat. We don’t need more to do. We need Jesus! 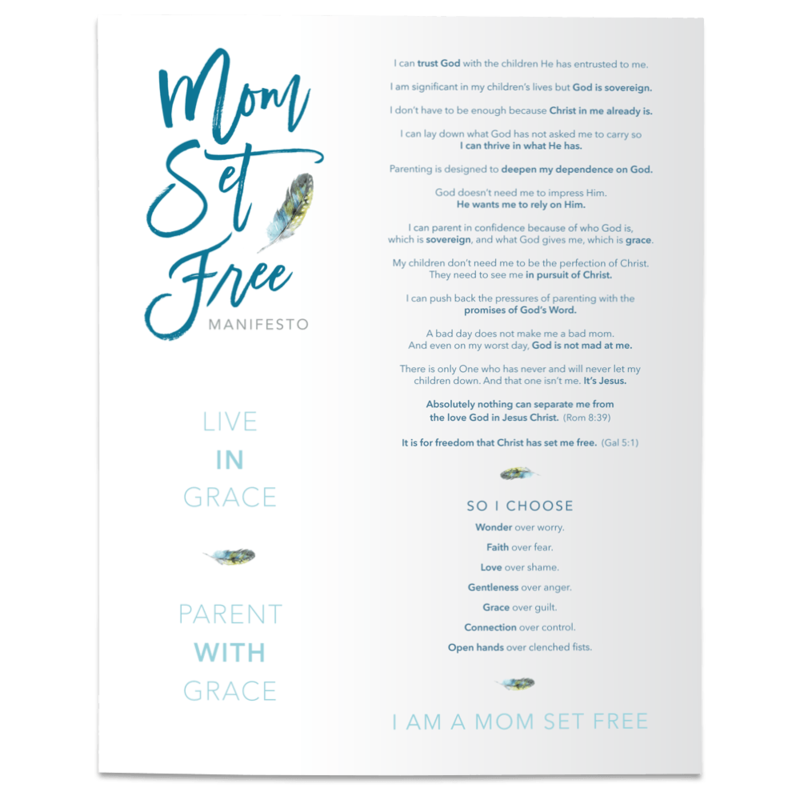 How has grace freed you to enjoy motherhood? First of all let me be honest. Motherhood can be gnarly. Don’t get me wrong here, I love my kids and am thankful for each one of them but this is not a glorified calling. Staying up all night to hold my daughter’s hair back for her as she throws up every hour doesn’t bring me happiness and fulfillment. And there are many other aspects to it all that I can certainly live without. But each time I am made fully aware of my weakness in the midst of whatever the current chaos is I am brought down to a place that shows me how very much I need a Savior, and that my friends is where I find true joy. Grace has freed me to enjoy my kids more only when I do not rely on their performance to feed my misplaced identity as “Mom Extraordinaire.” I no longer have to rely on my children to make me look good. Grace frees me to wake up each morning and rest in what Christ has done for me and my children instead of getting to work on proving myself. Christ proved it all for me on the cross by giving me His record of perfect righteousness and that is who I’ve become- His beloved daughter with whom He is well pleased. What freedom to know that I don’t have to spend my day trying to earn God’s favor. For me to believe this truth is a daily struggle and the only work that I need to do. With grace there is freedom and with freedom there is much joy. What is the main thing you want the reader to know when they finish your book? My hope for those who read this book is that they would walk away from it with more freedom, more peace and more love for their Savior. And I think that can be achieved with one statement – "There is nothing that you will do today to earn you more favor with God and there is nothing that you will do today that can lose you favor with God. Not one bit. If you are in Christ, you are in. Believe this and rest!" Excerpt from "How the Gospel Changes Motherhood"
“As a mother, it never feels like I can say “It is finished” about chores or caring for my children. But when Jesus said “It is finished” on the cross, he meant that for you and me as much as for any other believer. He was not merely declaring that his suffering had ended. He was declaring that the work of the law had been fully and perfectly completed on our behalf. His work was transferred to us as our work so that we may be counted as perfectly and completely holy according to God’s law. In this, we can truly rest. We can rest in his finished work for us. We can rest in his ongoing work in us and our families, even when we don’t see it. And we can rest in knowing that the weight of the world does not actually fall on a mother’s shoulders. Day after day, the priests under the Old Testament offered up sacrifices for the sins of the people. They could never sit down and rest because their work never ended; the world had fallen into a seemingly endless cycle of sin and sacrifice. But then God sent us the Great High Priest (Hebrews 10:11–14). Jesus is the only priest who could offer up a full and final sacrifice to atone for all of the sin of the world. He is the only priest whose work was ever finally finished. This is why he alone could “sit down” at the right hand of God: “So then the Lord Jesus, after he had spoken to them, was taken up into heaven and sat down at the right hand of God” (Mark 16:19).